iLLPHONiCS is a rare find. The experimental outfit is the kind of elusive group that can make a crowd both dance and think. 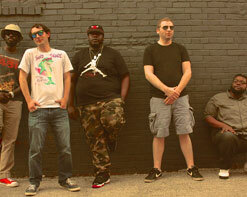 Using a soulful concoction of hard-hitting and real lyrics wrapped around a symphony of authentic jazzy bass lines, sharp drums, clean guitars, ever-evolving keys, and three-part vocal harmonies, this Missouri collective is more than a band, it’s an identity. For the past decade they’ve honed their sound on the backs of live performances across the country where they’ve shared the stage with artists like The Roots, RJD2, and Lupe Fiasco which has put them in front of thousands of listeners where they’ve held their attention from first note until the last. On their new single for “96to99,” the group celebrates the golden age of hip-hop that gave birth to an entire generation of inspiration that in many ways, still defines popular music today. The video for “96to99” delivers all of the right visual cues to bring the viewer back into the formative golden age of hip-hop. The video is shot on the Lewis Street waterfront section of St. Louis under the shadow of the Martin Luther King bridge and steps away from the Mississippi River. It follows a young “Fallout” Morris as he walks the streets, Sony Discman in hand, soaking in the sounds of hip-hop from all across the country. He happens to stumble upon the iLLPHONiCS crew, seeing with his own eyes the culmination of that inspiration, and being the good kid that he is, throws a buck into their fund. When another kid repping a Bulls hat (for full 90s effect!) snags his Discman, there’s no way he’s letting his prized possession out of his sights. So young “Fallout” quickly chases the culprit down, but instead of punishing him for his indiscretion he opts to share the gift of music, creating another lifelong fan of all things 96 to 99, while iLLPHONiCS is there to provide the fiercest soundtrack imaginable. We’re all very excited to be working with iLLPHONiCS and The Record Machine to bring you this exceptional new video. It’s a genre-hopping jam that we think will find an audience in all of your programming, so please get in touch with us to let us know what we can do to make that happen! Please contact Andy Gesner and the HIP Video Promo team at (732)-613-1779, email us at info@HIPVideoPromo.com. You can also visit www.TheRecordMachine.co or www.iLLPHONiCS.net for more info on iLLPHONiCS.